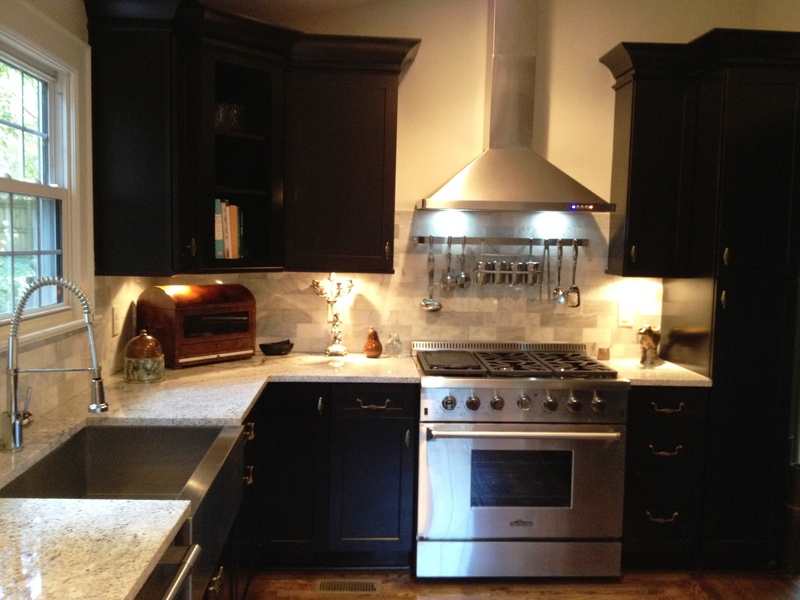 The kitchen of our lovely, old home has earned the “Most Changed” award among its peers. Nothing remains from its previous life. 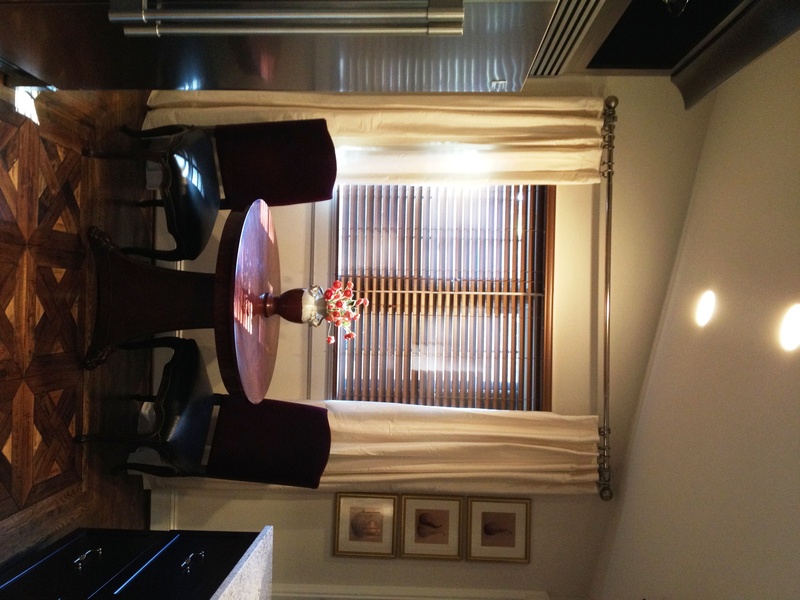 My husband and I stood in awe on our first look into the room at the back of the house called the kitchen. It wasn’t that this kitchen was not clean, it was simply ancient beyond belief. 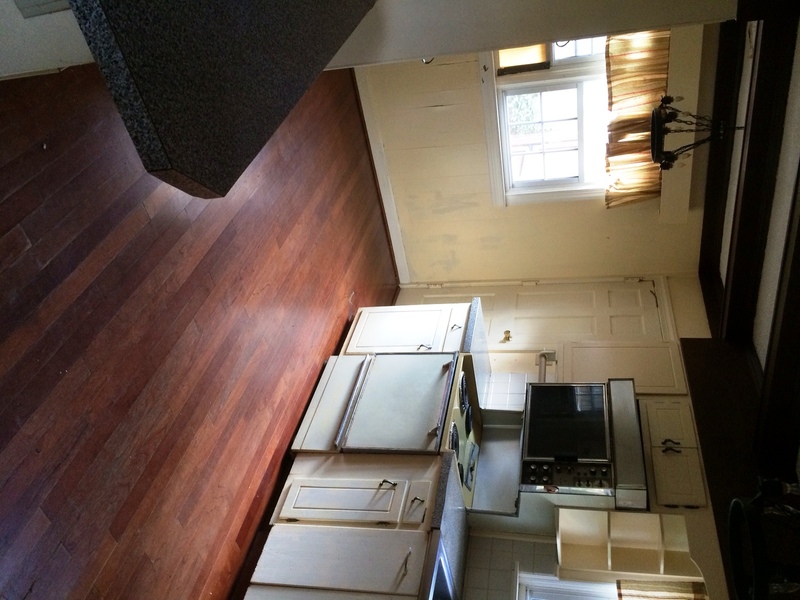 We estimate the original kitchen was last updated in the 1960s. 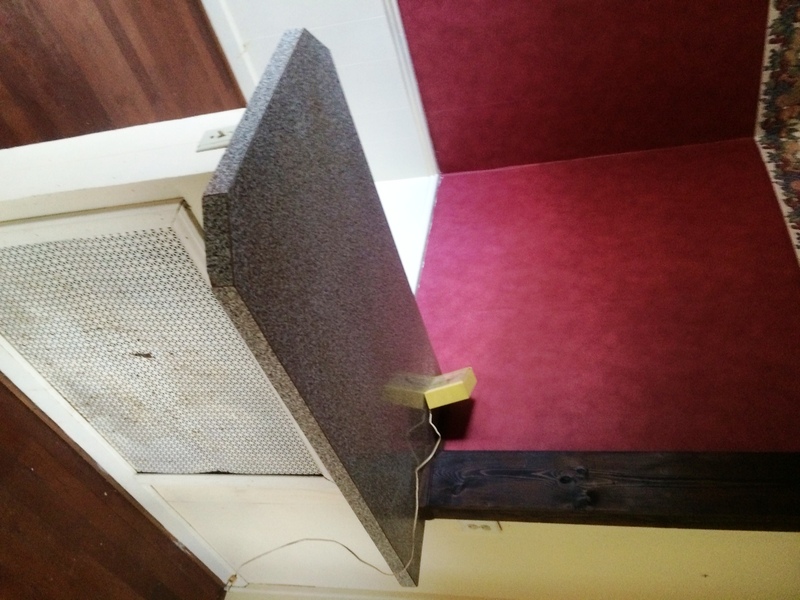 A counter atop the radiator divided the original kitchen from what was once a breakfast nook. The contractor wasted no time removing everything. She could only hope the sub-floor could be salvaged – it could not. You might say we had been given a clean slate, except that I call a clean slate designing from the ground up. . . no walls. 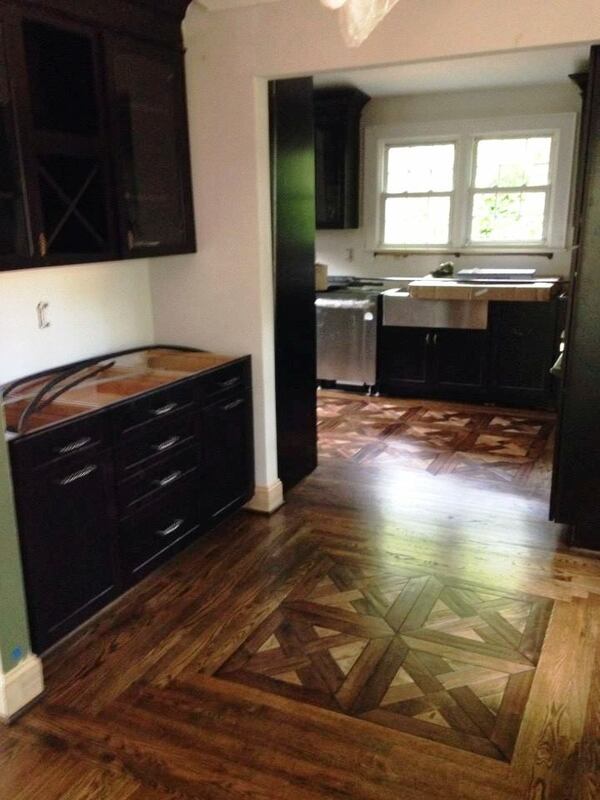 Everybody wanted six more inches of floor space, but there were only four inches to be found, and we spent a fair amount of time debating what those four inches of floor space would cost in terms of dollars and historical preservation. In the end, the walls stayed put. The basement stairwell prevented us from moving the walls of the kitchen. After a few searches across the world of online shopping, he found the perfect appliances, and we saved thousands of dollars in the process. 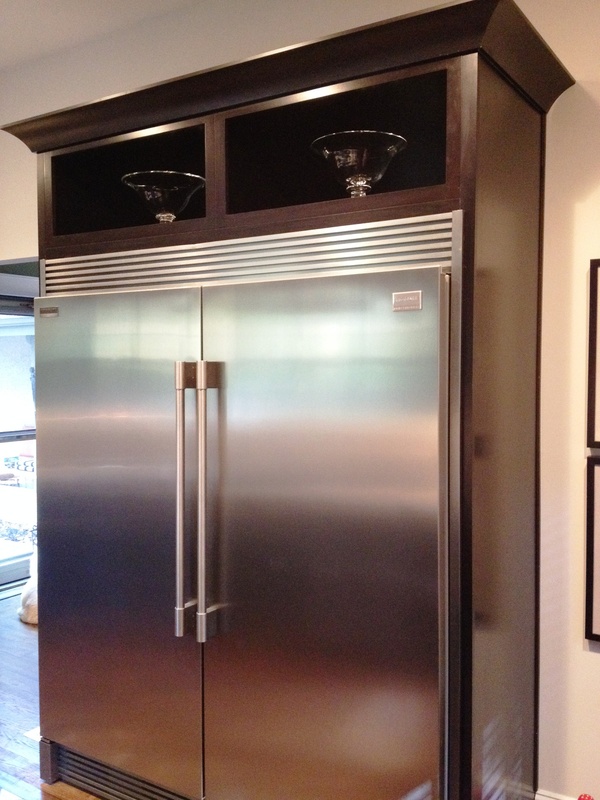 It was a scheduling adventure, however, to ensure the availability of each appliance would coincide with someone being at the house to accept the delivery, and space was available in the garage to store it. Sometimes it worked out, and sometimes it just didn’t. 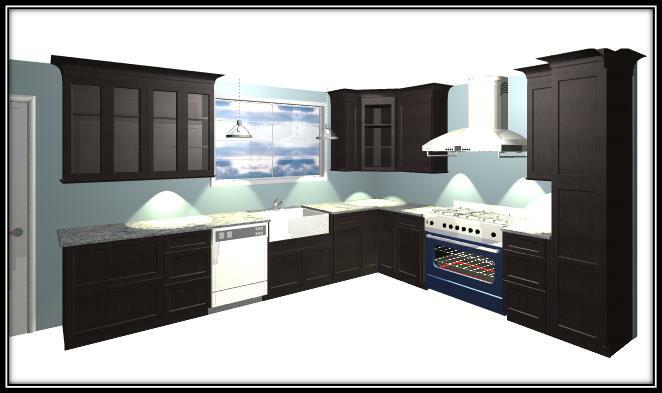 The design for the kitchen came to me almost immediately: white against dark. 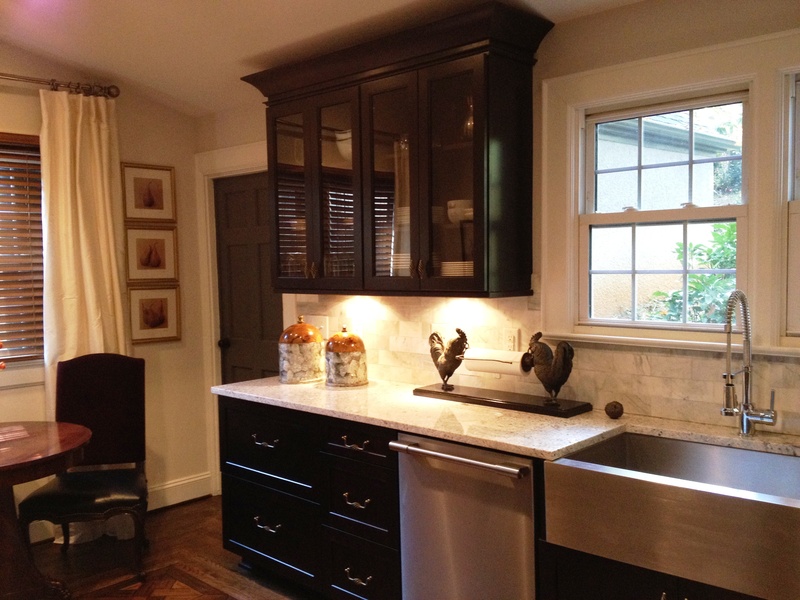 We selected the cabinets, and had great fun tweaking where there would be drawers, pull-outs, or glass front doors. 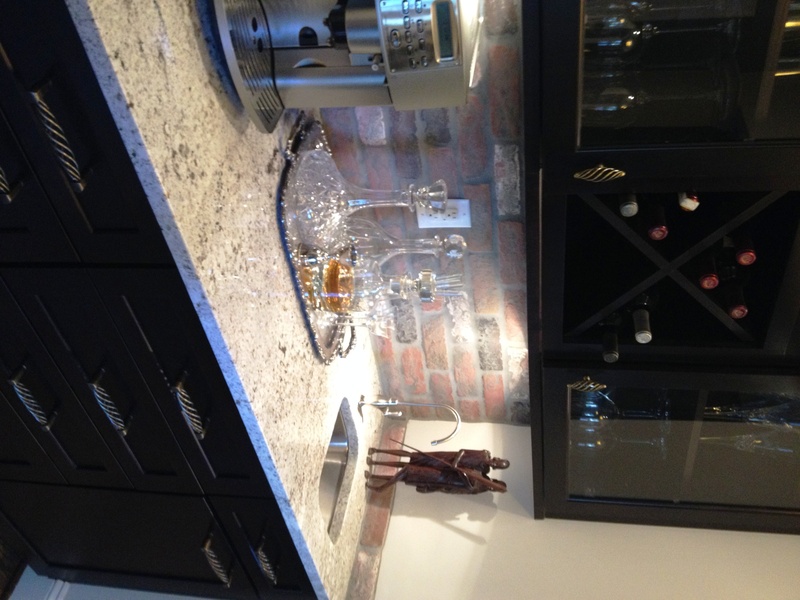 We worked with the cabinet designer remotely. 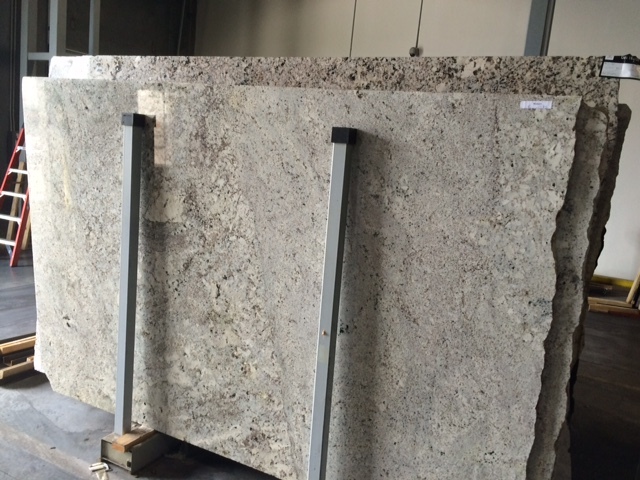 We selected the granite for the counter tops from a picture sent from the supplier. 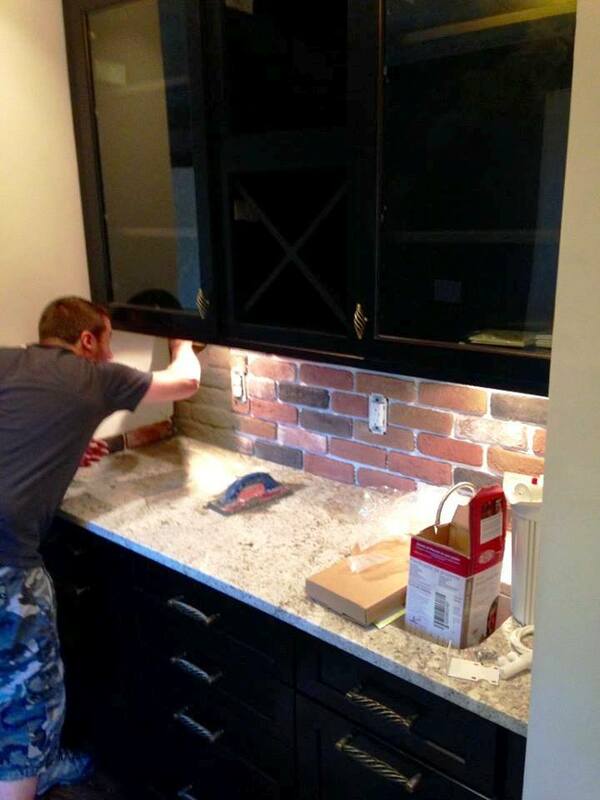 Brick veneer found on Craig’s List created the back splash for the butler’s pantry. Throughout the renovation, we made the 3-hour drive once each week. We spent about two hours meeting with the contractor to make decisions about the next week’s work, and admiring progress from the week before. 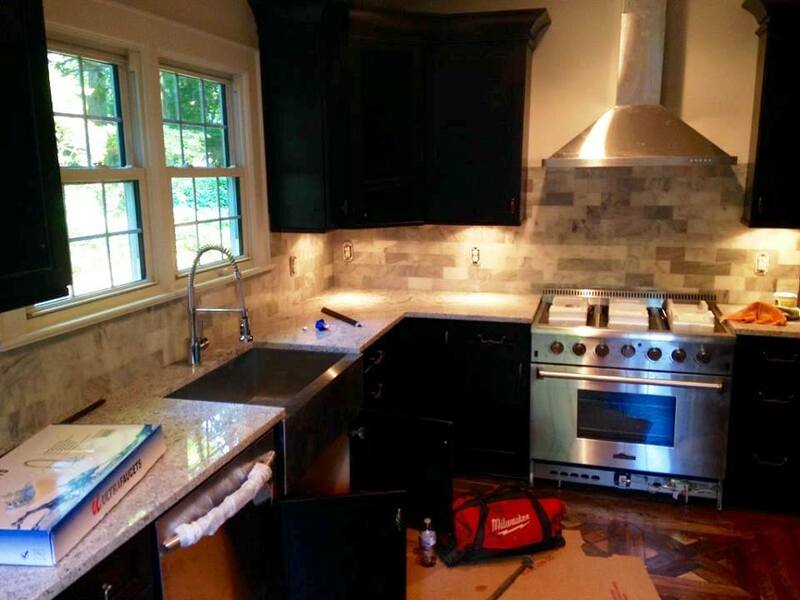 It was on one of these weekly visits that we experienced the most opportunistic moment of the entire renovation. 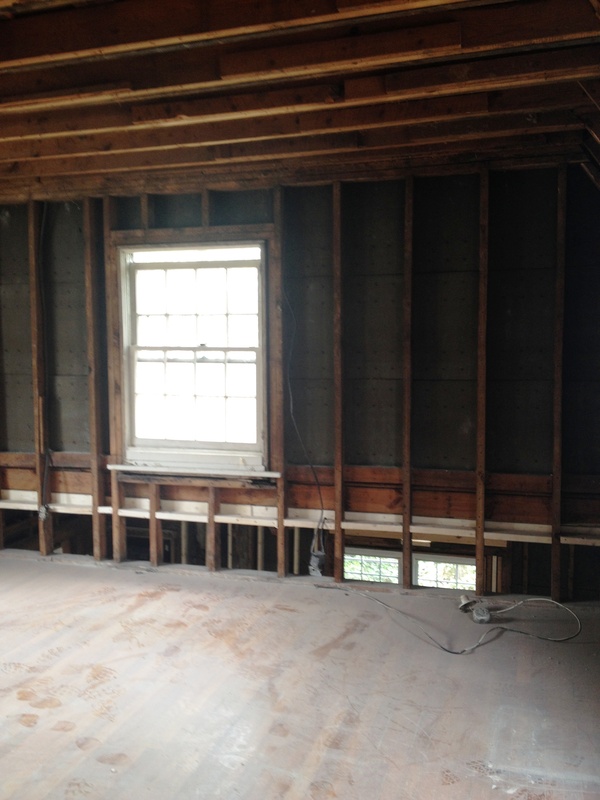 We were standing in the 2nd floor master bedroom when my husband looked down through the open flooring to the kitchen down below and noticed a “void” above the kitchen ceiling beams – a void that would allow us to vault the ceiling. 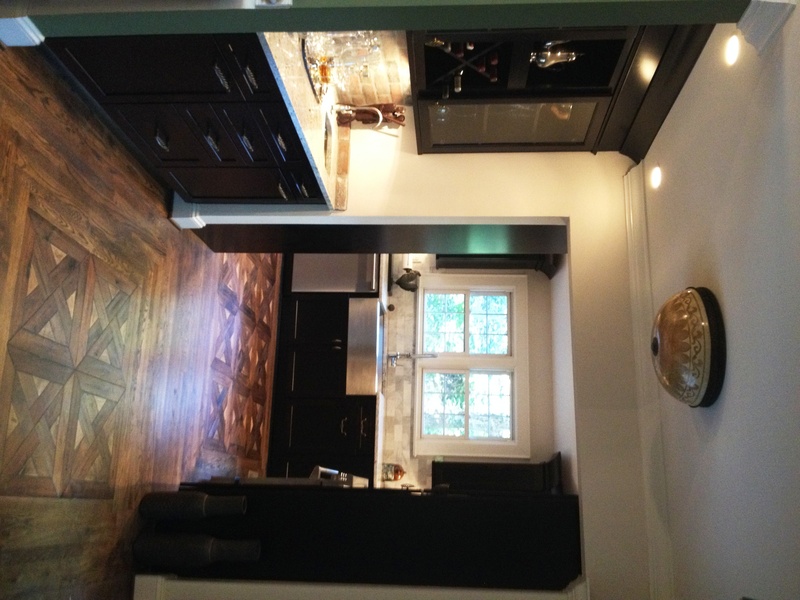 Although the footprint stayed the same, our little kitchen became infinitely more grand with a raised ceiling. 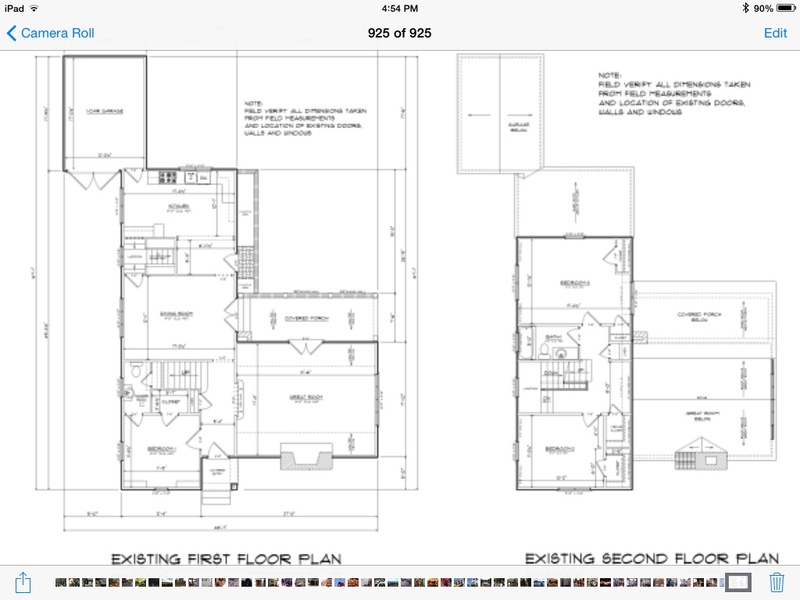 From the master bedroom, we could see a void between the floors. The granite counter-top cracked on its way from Charlotte, the sink got lost in the mail, and spots appeared out of nowhere on the front of the dishwasher — the whole unit had to be replaced. Sometimes, it’s not how you get there. . . it’s that you’ve finally arrived. 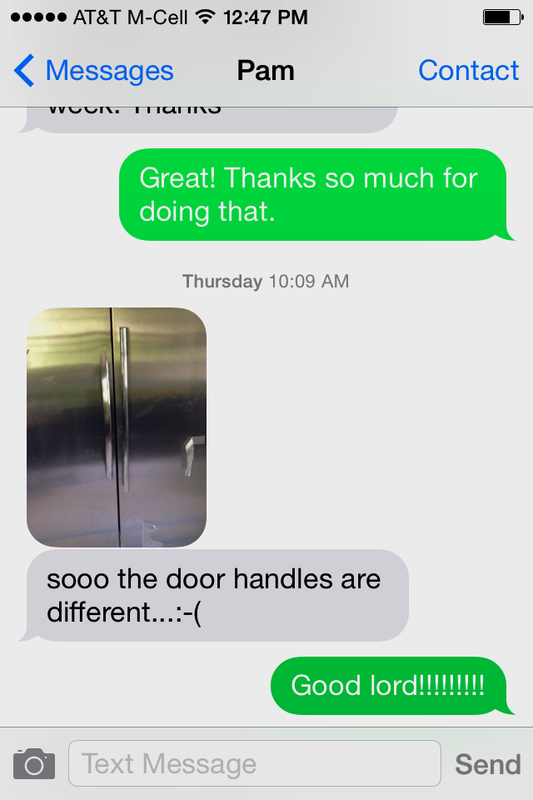 The refrigerator and freezer door handles finally match.